Explosive growth in mobile traffic, fueled by smartphone subscribers consuming and sharing video, is expected to continue in the next wave of 4K, 8K, and 3D formats, along with augmented and virtual reality apps. Connecting subscribers to their favorite media—regardless of location—and providing a better quality of experience are becoming key retention strategies for service providers. In addition to video traffic, the increase of data coming from a multitude of IoT applications will surely test the network. Meanwhile, communications service providers (CSPs) are under pressure to lower their prices, enhance user experience, be competitive, and reduce churn. With these factors, conventional RAN cannot keep up. It cannot aggregate capacity, nor can it handle local traffic surges. In addition, the current infrastructure is costly to maintain, and difficult to scale. This paper discusses the business need for a vRAN solution and how it can provide 5G benefits for CSPs in a 4G network. 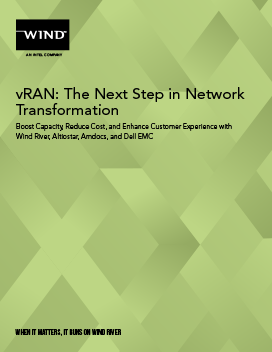 It also describes some of the key requirements for a robust vRAN deployment, and the components of an end-to-end solution provided by Altiostar, Amdocs, Dell EMC, and Wind River®.